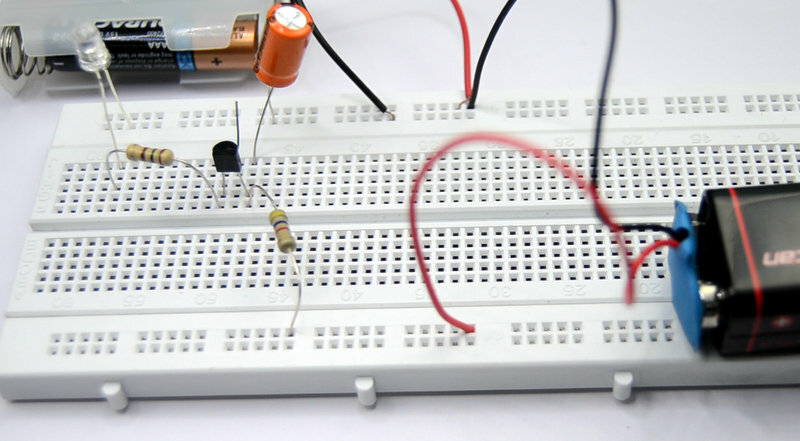 It is possible to blink or flash an LED using just a single transistor. This interesting circuit makes use of a rarely used property of the transistor known as the reverse avalanche breakdown. Since this is a non-standard feature, this may not work on all NPN transistors. Also note that you may need more than 9V voltage for this to get working on most transistors. I was able to get this working on BC547 transistor with a 12V supply. In reverse avalanche mode, the collector to emitter circuit of transistor is connected in reverse polarity. Hence positive terminal of the power source is connected to the emitter and the collector is connected to the negative terminal. In usual operation, very little current will flow from emitter to collector in this configuration. However, if we increase the voltage of the power source, beyond a specific value, the emitter to collector junction breaks down and large current will flow through the circuit. The base of the transistor is not used at all in this configuration. How Blinking LED with Single Transistor Works? When the circuit is connected to the 12V battery, current starts flowing through the 4.7K resistor charging the 470uF capacitor. This steadily increases the emitter to collector voltage in the transistor. When the voltage reaches the reverse avalanche breakdown region of the transistor, the emitter to collector junction breaks down and the capacitor is discharged through the 100ohm resistor and the LED. This lights up the LED. In the avalanche breakdown region, the transistor exhibits negative resistance, higher current leads to lower resistance! Due to the discharge, capacitor charge and voltage drops until the avalanche mode cannot be no longer sustained. The transistor enters its normal operation and emitter to collector high resistance is automatically restored. 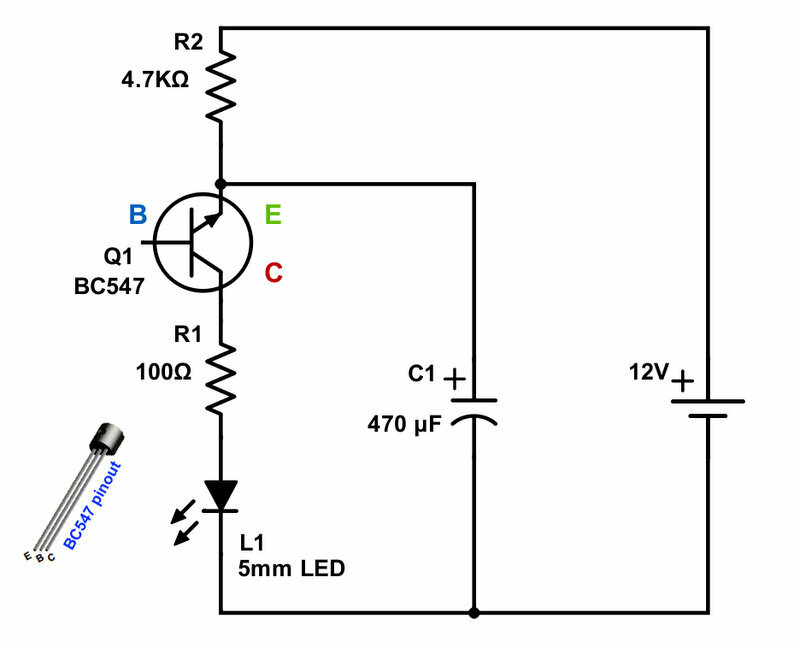 This switches off the LED triggering another cycle of capacitor charge and discharge! Note that we are not using the base of the transistor in this circuit. Commonly used NPN transistors such as BC547, BC548, BC337 etc. are not specifically designed for reverse avalanche breakdown operation. Hence I found the behavior of transistors erratic. For BC547 transistor I was only able to get the circuit up and running with a voltage of 12V and above. However, this behavior is not guaranteed since the same part numbers from even same manufactures can have different behavior when it comes to reverse avalanche breakdown!